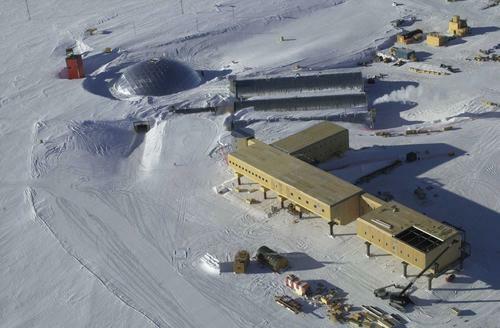 Our SIPS System for the International Science Station at the South Pole. Here Summer temperatures average minus 20 degrees Fahrenheit. Why do they build with our SIPs? The insulation and quick construction. If we can keep these guys warm, imagine how cozy your home will be.D.A.S.I. The Degree Angular Scale Interferometer - DASI - is 13 tiny telescopes working together to produce detailed images that help determine the universe's overall geometry and composition. Enercept provided the panels for the dish that protects the telescopes as well as the Martin A. Pomerantz Observatory building connected to the dish tower. D.A.S.I. is funded by the National Science Foundation. Why is the South Pole colder than the North Pole? At the South Pole, the surface of the ice sheet is more than two kilometers above sea level, where the air is much thinner and colder. Antarctica is, on average, the highest continent on the earth. However, the floating ice surface at the North Pole is only a foot or so above sea level. The Arctic Ocean, at the North Pole, acts as a heat reservoir, warming the cold atmosphere above it in the winter and drawing heat from the atmosphere in the summer. 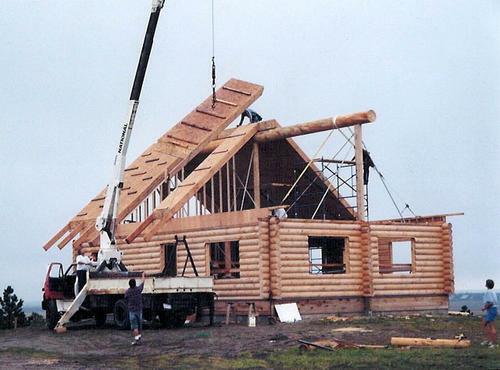 Log House Top off your log home with our SIPS roof!Our SIPS Roof Panels are pre-cut to your specifications. You won't have to worry about cutting complex angles - we do the work for you. The most cost effective dollar per R-value foam insulation, structure and sheathing available in one package. More usable square footage in your log home with fully vaulted ceilings. Snow loads to 250 pounds with structural roof panels. Roof framing made easy with the industry's most fully customized roof panels. Compound angles and valleys are not a problem. 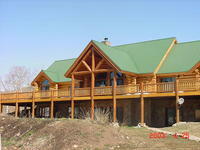 Keep your log home warm and cozy with our SIPS system of insulated roof panels. Enjoy the beauty of exposed logs while saving money each and every month on heating and cooling costs.Our people are friendly, knowledgeable and always helpful. The panels are amazingly easy and fast to assemble ... they just slip together. Most fully customized SIPs roof on the market. Call today for more information.